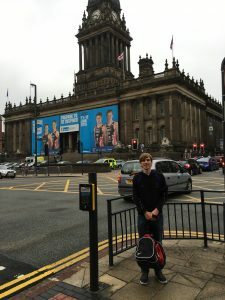 I arrived in Leeds the afternoon before the race, to complete registration and set-up my transition for the early morning. As it is a split site, this is no mean feat: registering close to the finish line, setting up your run gear at T2 in the city centre and then driving out with the bike to Roundhay Park for bike checks and setting up T1. The problem with all this was just trying to get information. The race had plenty of volunteers from the local area, but very few personnel from WTC to manage the volunteers and provide second-tier support. This meant the volunteers were not given all the information so it was often hard to find someone who could answer the questions. Additionally, the transition zones were still under construction, with no directional signage or inflatable arches in position yet. That meant both the Technical Officials (many of whom I knew from Scotland) and the volunteers were getting a lot a questions about the basic flow through transition. All of these questions could have been headed off by simply providing adequate signage. After the frustration of the previous day, the morning of the race was all fine. I went in to T1 and double-checked everything and got sorted in my trisuit and wetsuit. No drama. With my swim time being a little over double my 750m pool swim at St Andrews a few weeks previously, I’d say that was good swim from my first Olympic distance and open water swim of the year. The GPS doesn’t show any major deviations from the course either, which is another good sign. T1 was a mammoth run. 500m just to my bike, then a further run with the bike and having to hold my T1 bag containing my swim gear. It’s no wonder it took so long. Running with a bike and bag while wearing cleats is no mean feat either. The course was great. A couple of nice hills including immediately out of transition. For the most part, the roads were wide and nice to cycle on, although the course was somewhat crowded. It was at this point I started to see a whole bunch of fellow ETs (Edinburgh Triathletes) on course too, which gave me a burst of energy. I do remember having one sticky moment where I thought I might get a little to close to a spectator and crash barrier around one of the corners, but a major catastrophe was averted. All I heard was a few expletives coming from the spectator. Unfortunately, I did manage to puncture on bike course at around halfway. This was a racing first for me, and so the first time I would have to change an inner tube on the clock, and the first time of using my CO2 inflator. I told you it was a race of firsts! Looking back on Strava, it seems this only cost me around 8 mins, which I thought was fairly respectable. T2 was more respectable and straight forward. The surface was gravel, which I guess made life harder for those who take their feet from their shoes in T2, but all went ok for me. I remember that it was surprisingly hard to get my bag containing the running shoes untied from the racking, that was the only sticking point. I had not tried a 10km run off the bike before and boy was it hard. The only upside is that with the longer run, you get more chance to ‘settle in’ and get rid of the jelly legs after cycling. The course is predominantly up and down an inclined shopping street in the city centre. This makes it great for spectators, but the slight incline really takes its toll on 4 laps. I swear it was getting steeper and longer on each lap! This was another place where the presence of so many ETs, both racing and supporting was a real boost to my enthusiasm as I was running. It is so nice to be part of a large club! The friends I was staying with and my girlfriend also formed a great support crew, and 4 laps gives ample times to pass them and high-five! For all the effort of the run, I was tremendously pleased with the 53 minute 10k off the bike. I think it compares favourably with my 47min straight time. I still need more running in my training programme though! 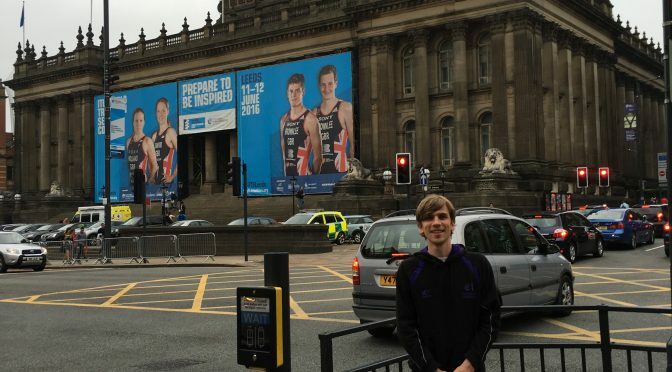 This race gave me a huge amount of confidence – I stepped up a distance and achieved it. I didn’t let the organisational troubles affect my race and a calmly fixed my puncture. All in all, I think I can pat myself on the back for this one. The race organisation woes continued post-race. The swim gear bags along with a bag dropped off at swim start (last minute items such as warm clothes taken off just before the swim) were due to have been available for collection at the finish line as soon as your race was over (assuming you took more than a set time, 2:20 I think). For many people, this did not happen. I think this is the most damning part of the failure as it had important consequences for many. Depriving athletes of warm clothes, mobile phones, car keys etc, everything they would have taken to swim start with them is simply unforgivable. Some people had to wait hours and others were told to go back to Roundhay Park and pick them up. 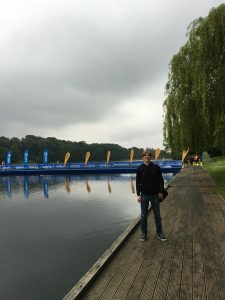 I note that this year’s race (which has already happened…I am so slow at writing) was directly organised by British Triathlon and I’ve not heard any of the same complaints, so I think they were able to improve the race. I have also heard that race entries for 2017 were significantly down, with people staying away after so many horror stories from 2016. With 2017 now passed, I hope 2018 will re-ignite interest in what is a great course.